Beautiful Mint Condition Home in the Hamptons Near the Beach! 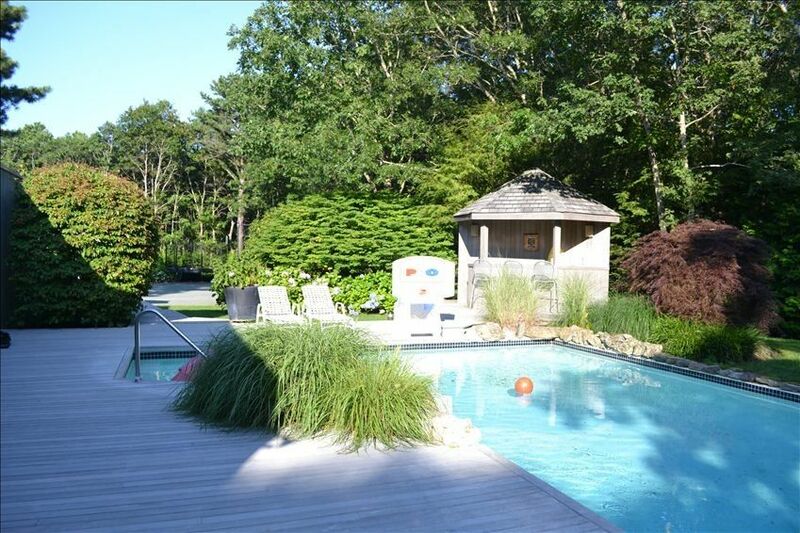 Gorgeous Six Bedroom Summer/Beach Home with Heated Pool and Har-Tru Tennis Court located near the beach only an hour and a half outside New York City. Easy access by car,bus train,boat or helicopter. The house is in triple mint condition and the property is stunning(manicured and very well cared for). There is a basketbetball hoop in the pool also with pool toys and pool chairs. Around the pool are several lounge chairs. There is also an outdoor Viking Grill and a round table and chairs to eat at . A portion of the large pool deck is covered with a Jumbrella if you prefer shade. There is a Tiki Bar near the pool with a working fridge and electric outlet to make Margaritas or you beverage of choice. There is an enclosed trampoline for your kids or for the kid in you. Inside the house is an Open Chefs Kitchen with brand new appliances including a Gas Grill a Subzero Fridge. There is an open dining room with fireplace and a family room with a large tv with cable and games as well. There is a ping pong table near the family room. There is a laundry room with a washer and dryer. Downstairs there is a large master bedroom with a walk-in closet and ensuite bathroom with a large jacuzzi. There are two more bedrooms downstairs. One with a queen sized bed and the other with twin beds. There are two additional bathrooms downstairs.Upstairs there are three more bedrooms-two with queen sized beds and one with a queen sleeper sofa and a crib if you are traveling with a baby. Overall the house if beautiful. We have a housekeeper,gardener,pool guy and caretaker that attend to the house year round. The house is our second home so it is very pristine. You will love it! We rented here 2 summers ago, and came back again for another week vacation this summer. As before, it was a wonderful, totally relaxing experience - - beautiful grounds, furnishings, tennis court, pool, ping pong table, great kitchen, bright and spacious throughout, excellent for entertaining. You really feel you are getting away from it all when you are here, yet you are very close to numerous fine restaurants if you wish and shopping in the Hamptons. And the owner is always extremely friendly, helpful and responsive to any questions or requests you may have. Couldn't have been better - we are definitely coming back! I stayed in this house for a weekend with my extended family, including 7 of our kids ages 14-22. We have rented homes in the Hamptons before but they were not as nicely laid out or furnished as this one. The house itself is beautiful, there was a lot of room to hang out both in and outside-- which is good because unfortunately for us it rained all weekend. We were happy to have such a big open living area-- that included a ping pong table and large screen TV-- to hang out all together inside. The owner is available and attentive to any needs and I much preferred it to renting from a third party. We plan to rent this one again next summer! Thx Jodi. Loved having you. You were a pleasure to do business with....look forward to having you back next summer! Great long weekend at the "Compound." My friends and I (12 of us total) had a great time at this house. It's more like a compound with a beautiful pool, a tennis court, trampoline (for the kids), plenty of seating areas, an amazing grill, ping pong table, and giant screen tv. It was a short drive to Westhampton for the shops, restaurants and bars, but we mainly stayed at the house, cooked and got plenty of use out of the frozen margarita machine. Everyone (kids and adults) had an amazing time. The owners were very responsive which made the entire experience hassle-free. First off, I have to say I have rented a bunch of houses in the Hamptons before but I have never interacted with an owner like this. She is one of the nicest people I have ever dealt with. She was quick to respond to any of my questions and was helpful from start to finish. I even got my security deposit back within 6 days. I have absolutely zero complaints about her or the house. Everything was in perfect condition. Everything was clean and maintained very well. We had a pool, tennis court, trampoline, fire pit - what more can you ask for? It was definitely the most relaxing weekend I had all summer. I have my husband asking me everyday when we are going back. I can't wait to do it again next summer! We spent a week in this house and had a wonderful time. It is a winner - - tastefully furnished, spacious, bright, and perfect for entertaining. The property is beautifully maintained, with a fine swimming pool and tennis court, and a very relaxing and tranquil ambiance throughout. The owner was also very helpful, promptly answering any questions we had and giving us a great set of restaurant and shopping recommendations in the local area. For a truly delightful escape, we would definitely go back and rent this house again. Highest recommendation! Highly recommend this wonderful home on one of the best streets in Quogue. Rented for three nights with my wife and two children over a superb fall weekend. My son, 17, who often makes us feel that our greatest achievement is to bore him, pronounced that he could live here for a month. My daughter, an internet executive, said it was perfect. My wife was jealous that she didn't own it. Amenities include Sonus wireless music inside and out, IPAD, large screen tv with XBOX, ping pong. The pool deck has a commercial umbrella set in the ground that will shield the entire area making it comfortable in any weather. Absolutely Immaculate. The owner was very helpful with local restaurant choices and other questions. A local contact was provided for any issues. Wow! Thank You Adam for you kind words. It was a pleasure having you and your family! You are welcome back anytime!! $300 flat rate cleaning, otherwise fee is all in. Cleaning fee is subject to change to a higher fee for longer stays. Pool Heat is available at an extra fee. Pets are possible based on a prior conversation and agreement with owner. Smoking is not allowed at anytime in or on property. Beach passes are possible but not guaranteed.